Against a backdrop of sand tiger sharks in the GOT, the Aquarium's CFO Walter Flaherty invited a marine biologist with the Massachusetts Executive Office of Environmental Affairs to share his exciting research about white sharks at a media event on Wednesday. Dr. Greg Skomal tagged several great whites off of Chatham last summer in order to track their migratory patterns. Well, those tags have recently started returning valuable information. To his surprise, he is finding that the sharks are generally hugging the Eastern Seaboard and are wintering in Florida. Skomal explained that he was surprised the sharks appear to be sticking so close to shore because other data indicates white sharks in the Pacific head far out to sea. But he also cautions that scientists are at the beginning stages of understanding the habits of these fascinating predators. Tracking migratory patterns are just one little step to getting a greater understanding of their behaviors. The state's research might not come as a surprise to our right whale observers. They spotted a huge shark off the coast of Georgia and Florida earlier this winter. Visit the Right Whale Aerial Survey Blog to see the picture. At first, they actually weren't sure whether it was a shark or a baby whale! Through our own research projects and the work of our colleagues, the Aquarium is wholly committed to developing and implementing new solutions to protect sharks living in our oceans. We were happy to be able to host this exciting announcement. Learn about some of our research projects on shark mortality and stress physiology. And how about those sharks that were on display during the press conference? 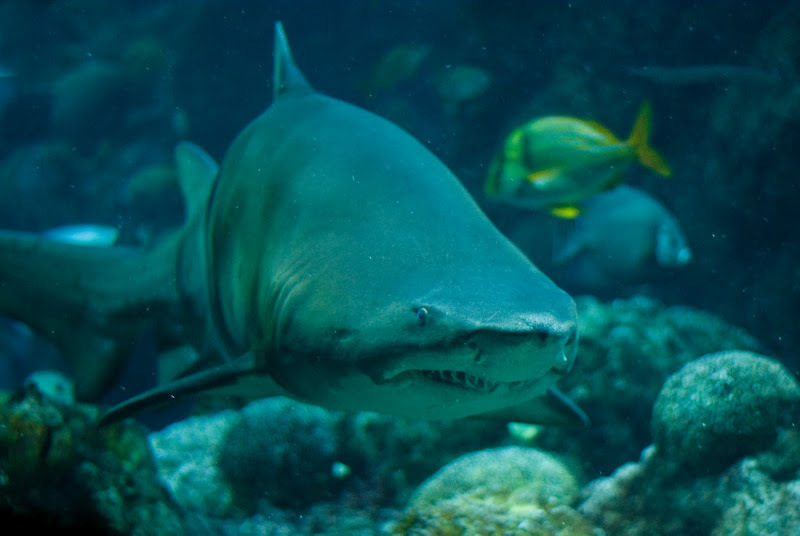 The GOT Blog is a great resource for information about sand tiger and nurse sharks. See what it takes to give these large predators a full physical exam. You also can find out just why sand tiger sharks have so many teeth. North Atlantic right whales switched at birth! Dive 'Under the Sea' in IMAX 3D! Special deal for Aquarium member moms! 'Hubble 3D' is now playing! 'Hubble 3D' soaring with positive reviews! Show the world how you live blue! See Avatar on the largest screen in New England! Have you caught 'The Ultimate Wave' yet?